Welcome to my world where I often eat, breathe and sleep colorful combinations of clothing. I am very excited about the merchandise in the More Store this spring. It is a bouquet of sun-drenched, vivid color! Warms the heart and soul after a snowy winter. 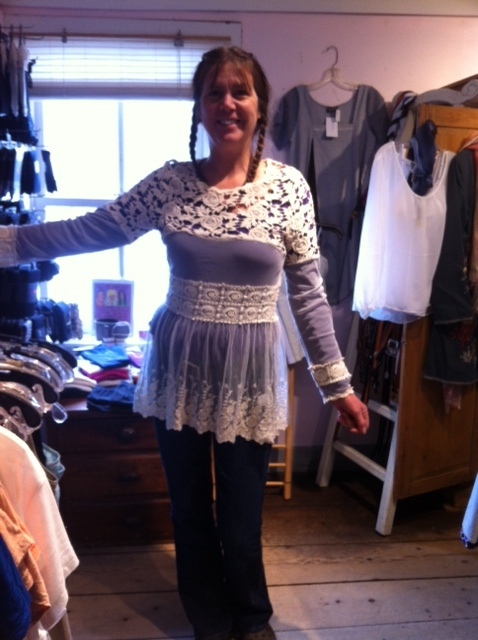 Colleen rocking a new lace top from Hazel. Navy is back in a big way in beautiful dresses from Nadia Tarr of Brooklyn and Jana. Each are easy knits that can be dressed up for a wedding or worn with flip flops to the beach. Spice up the navy with fiery red cardigans by Jana or Wooden Ships. Coral is huge this year from soft (Kensie’s adorable little blazer with black and white polka dot lining) to blazing (CMC’s cupro/rayon tiered dress). Colored jeans are a big trend for spring ’13 and we’ve got them in French blue, red and tangerine from some of your favorite jean companies: Christopher Blue, Not Your Daughter’s Jeans and Silver. A new line, Liverpool Jeans, will be arriving any day, great fit and price in primary colors. Scarves, scarves, scarves! Tie up your outfit with solids, prints, knits, silks and pashminas! From V. Fraas, Asian Eye, Pistil, Sucre Soir…they are an absolute MUST HAVE accessory this spring. Those of you who know me, know how much I love lace and ruffles. For the past 6 years I have been restraining myself but now I am in heaven. Lace is in vogue and in the store in gorgeous, romantic tops and vests from Hazel that can be worn casually with jeans for a new, edgy look. Yumptious! Have you filled out your Save with Six card? It’s a great way for you to shop and save, so come in and get yours going and see all the exciting, new things in the store. Yay! How about pictures of all the available tee shirts so a gal who lives a long ways away will know which one she wants to buy……:) Please? Happy blogging! Great idea! Thanks, Angie. We will put up some photos at the beginning of next week.